I'm sure you know I have a wishlist a mile long. This dress had been at the top for over six months and now it's finally mine! I love the cut of this dress: the deep v in the back, the cap sleeves with the little peekaboo slits, and the longer length. Of course, the print is amazing and an absolute showstopper. 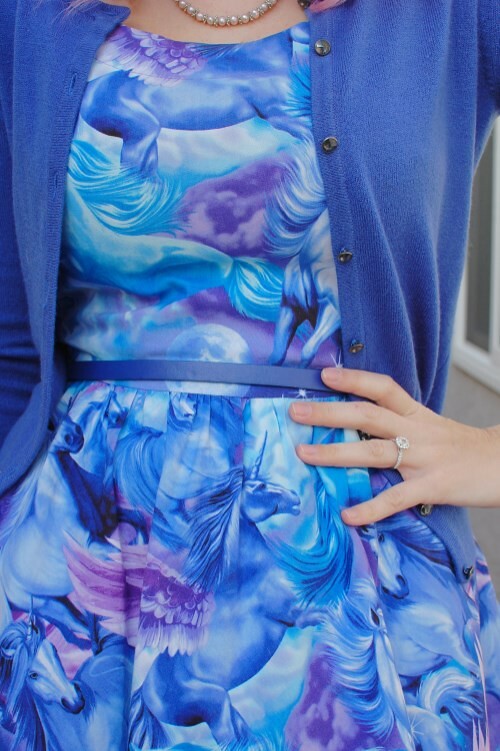 When Kevin first saw the dress he didn't even realize there were unicorns on it! Your eye doesn't know where to land first which means it's the perfect addition to my closet of novelty prints. I was lucky enough to go and get my hair done yesterday. While I'm fully capable to do it myself, this momma needs some pampering from time to time! It's also great because my friend is a hairstylist and also has a little girl so we get to have some no baby time together. We pretty much talk about our girls the entire time, but it still counts! P.S. Don't forget to enter my Sourpuss Clothing dress giveaway HERE!